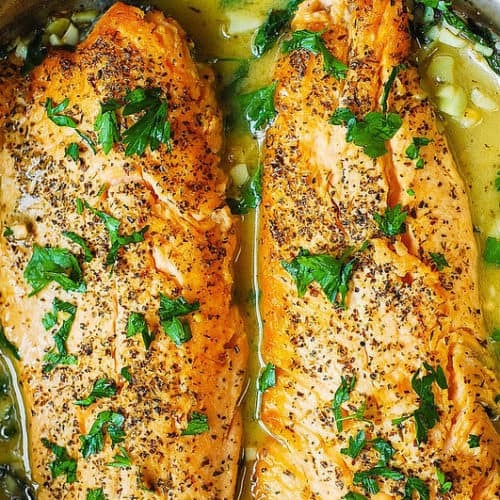 Trout Recipe with Garlic Lemon Butter Herb Sauce – simple and delicious way to cook fish, especially if you’re in a hurry! The whole recipe takes only 30 minutes. Italian herb seasoning, chopped fresh parsley and garlic give great flavor to the fish! Healthy, low-carb dinner rich in lean protein and omega-3 fatty acids. 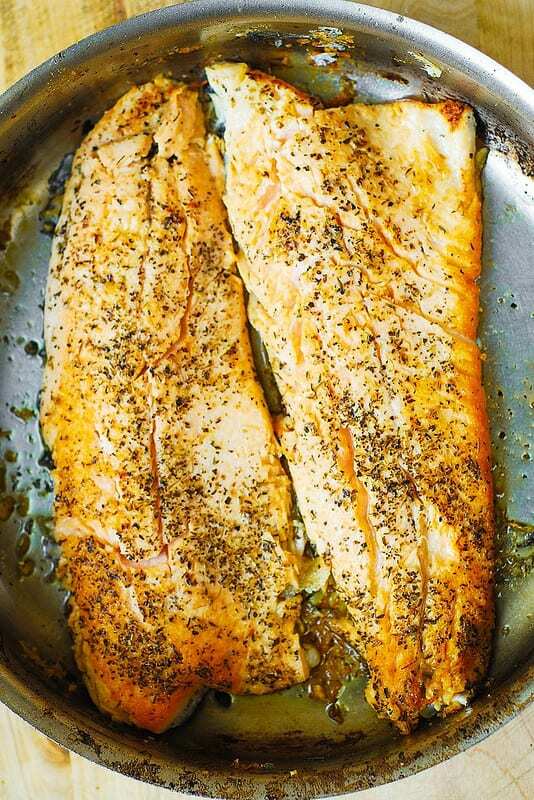 Trout fillets are usually pretty thin which makes them perfect for cooking on stove top in a skillet. One of the best trout recipes I’ve tried is simply cooking the trout in the skillet in olive oil, and then adding garlic, lemon juice, white wine, fresh parsley and butter. That’s it! Simple and delicious. The ingredient list for this trout recipe is short and simple. The trout itself is such a delicate fish with a great flavor, it doesn’t need too many ingredients or special technique to enhance it. So, just cook it in a large skillet on stove top with olive oil and butter, garlic, butter, lemon juice, white wine, fresh parsley. The cooking times are short since trout fillets are usually pretty thin. This trout recipe takes only 30 minutes from start to finish. I have also made this recipe using the type of fish I’ve never cooked with before – Arctic Char. Arctic Char looks very similar to trout, and it’s closely related to both salmon and trout. 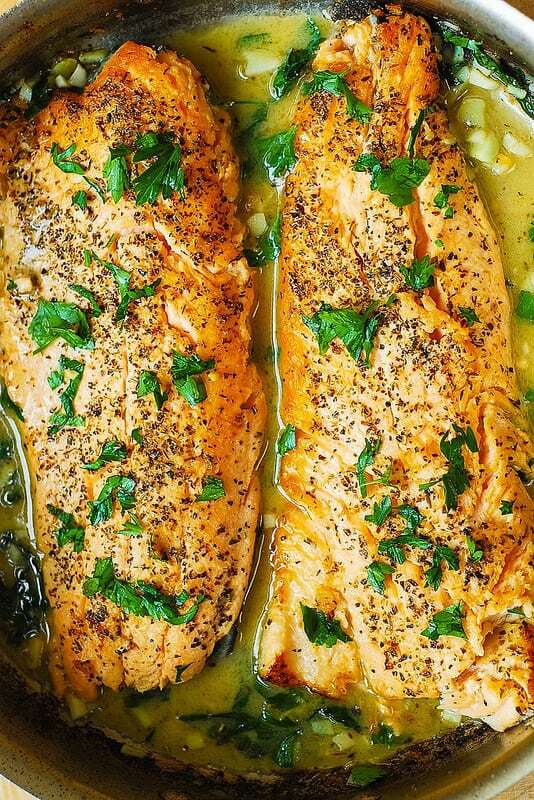 Therefore, this recipe will also work with salmon and arctic char. Very easy and versatile! 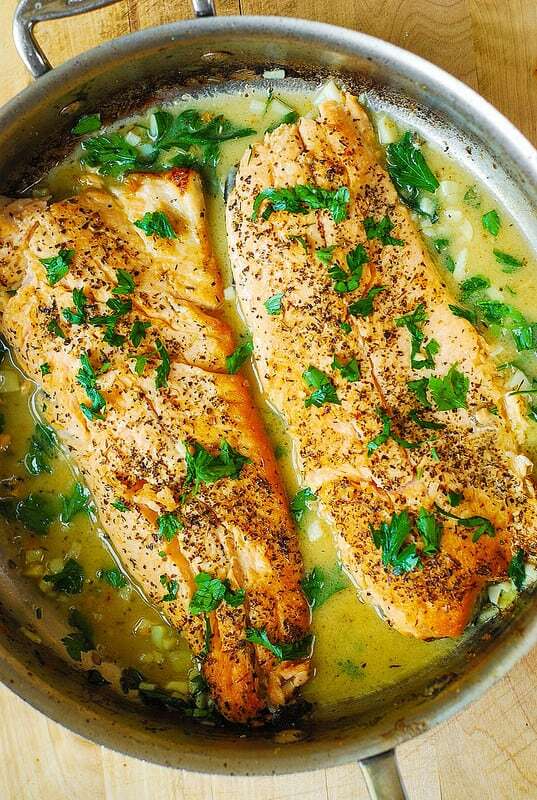 Another simple way to cook trout is simply to enhance it with capers, garlic, lemon and butter. I combined just those ingredients to make this easy and delicious Trout with Caper-Garlic Lemon Butter Sauce. And yes, I used steelhead trout for this recipe but you can use a regular trout. One of the best trout recipes I've tried is simply cooking the trout in the skillet in olive oil, and then adding garlic, lemon juice, white wine, fresh parsley and butter. Gluten free, healthy, easy-to-make and delicious! Low-carb dinner rich in lean protein and omega-3 fatty acids. A family favorite! Perfect way to cook an amazing fish: trout. Season the top of fish fillets with Italian herb seasoning and salt (generously). Fish fillets will have skins on the bottom - no need to season the skins. In a large skillet (large enough to fit 2 fish fillets), heat 2 tablespoons of olive oil on medium heat until heated but not smoking. To the hot skillet with olive oil, add fish fillets skin side up - flesh side down. Cook the flesh side of the fish for about 3-5 minutes on medium heat, making sure the oil does not smoke, until lightly browned. Flip the fillets over to the other side, skin side down (add more oil, if needed). Cook for another 2-4 minutes on medium heat (to prevent oil from burning). Remove the skillet from heat, close with the lid, and let the fish sit for 5-10 minutes, covered, in the skillet, until flaky and cooked through completely. After the fish is cooked through, off heat, using spatula, carefully remove fillets to the plate, separating the fish from the skin. Carefully remove or scrape the fish skin off the bottom of the pan, making sure to leave all the cooking oils in the pan. Add diced garlic, lemon juice, and white wine to the same pan with oil. Cook on medium-low heat for about 1 minute, until garlic softens a bit. Remove from heat. Add 1 tablespoon of chopped parsley, and 2 tablespoons of butter, off heat, to the sauce, stirring, until the butter melts and forms a creamy mixture. Add fish to the pan, spoon sauce over the fish, top the fish and sauce with the remaining 1 tablespoon of parsley, and serve. What have I been cooking in my kitchen? I made this once before and it was phenomenal. Thanks! I just brought home 12 lbs of trout from the lake today and plan on cooking up more. Looking at the ingredients list, it calls for 1 tablespoon of thyme, oregano, and parsley. Do you use 1 tablespoon of each spice? Or combine them all to equal a tablespoon. It’s a little unclear… and I cant remember what I did last Fall. Thanks again! Definitely trying this recipe this week! Any advice on what to serve with it? Rice pilaf and steamed veggies is good but we are pretty bored with it. I made this and my family loved it. I had a question , I wanted to try making it for a potluck I am going to. Is this something I can make earlier in the day and serve room temperature or warmed up a few hours later? You can warm it up a few hours later. However, when cooking fish, my personal preference is to serve it right after cooking to avoid overcooking the fish when you reheat it. This was so delicious. Fish is easy to dry out and this method of keeping it in the hot pan after cooking really helped avoid that. Thanks! You are very welcome! I am glad you liked this recipe! This looks good and healthy, but the cholesterol level worries me. I don’t really care for fish and will only cook it occasionally because I know it is good for me. I tried this recipe with trout and thoroughly enjoyed it. I liked the tang of the lemon sauce. I will definitely try this again, maybe with salmon next time. Very nice recipe. Thank you! 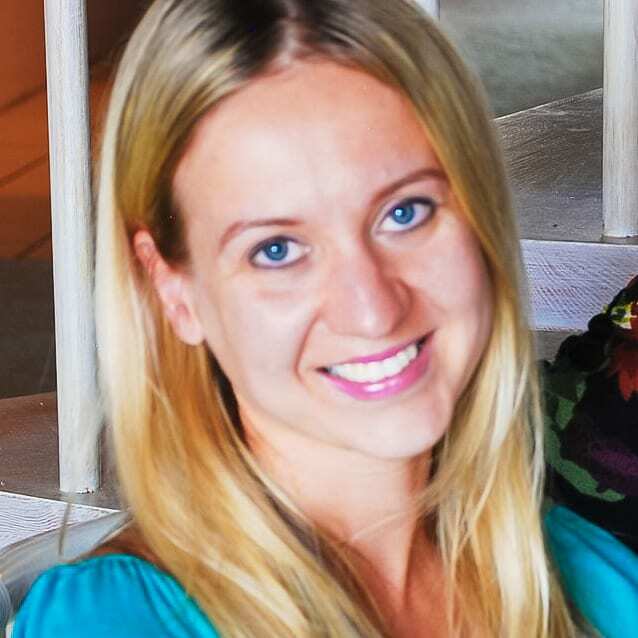 I am so happy you tried this recipe and enjoyed the flavor of fish! Love to read comments like yours. Thank you for such a kind comment!